Camilla Wicks was one of a group of elite female violinists who forged distinguished careers in the mid to late twentieth century. The names of Ginette Neveu, Johanna Martzy, Ida Haendel and Erica Morini are four others that immediately spring to mind. Wicks was born in California in 1928 of Norwegian parentage. Her father was an eminent violinist and teacher, and her mother played the piano, having studied with Xaver Scharwenka. Early lessons with her father resulted in a debut at the age of seven playing the Mozart D major Concerto K 218. Aged eight she had progressed onto the Bruch and Paganini Concertos. At ten she went to study at the Juilliard with Louis Persinger, teacher of Menuhin and Ricci. She also had a year with Henri Temianka. She debuted at Town Hall, New York in 1942, accompanied by Persinger, and a year later took second prize in the prestigious Leventritt Competition. Her Carnegie Hall debut came in 1946 with the New York Philharmonic under Artur Rodziński in which she performed the Sibelius Violin Concerto. The work was to become her calling card, and she made a commercial recording of it in 1952, now elevated to legendary status (Biddulph 80218). Sibelius, himself, was very taken by her interpretation, and she performed it in his presence on the occasion of his eighty-fifth birthday. 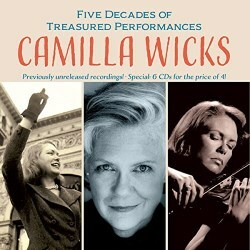 Wicks always remained in touch with her roots and, throughout her career, promoted music by Scandinavian composers. Several wrote works for her including Bjarne Brustad, Fartein Valen, Hilding Rosenberg, Harald Saeverud and Klaus Egge. In the 1950s, she abandoned her career, selling her 1725 Duke of Cambridge Strad, married and raised five children. In the 1960s she resumed playing in public, with the generous gift of a violin by her friend Ruggiero Ricci, and became a much sought after teacher. She retired in 2005. This important tranche of material derives from both the vaults of radio archives and Wicks' own collection. Her discography is relatively small, amounting to a single CD from Music and Arts containing live performances of the Beethoven and Sibelius Concertos, a couple of CDs on the Norwegian Simax label (review ~ review) and a Biddulph CD. This welcome box set redresses the balance by considerably expanding her discography. Whilst standard fare constitutes a large proportion, the inclusion of less well-known composers is a positive bonus. Of the core repertoire works, CD 1 opens with a rhythmically propulsive account of the Mendelssohn Concerto from 1949. The conductor is none other than Fritz Busch, brother of the famous Adolf, another great violinist. Busch mirrors Wicks’ pushing forward in the first movement. The second subject is lyrical, and the employment of expressive slides and position changes is a positive feature of the violinist’s artistry. The second movement is ardent, and the third boasts a well-articulated line. Although the sound quality belies its age, the performance is thrilling. The Brahms Concerto from forty-five years later has to be one of the finest I’ve heard. In the first movement Wicks employs the Joachim cadenza. The slow movement is eloquently phrased and, once again, those expressive slides come into play. The finale has energy and rhythmic bite. Sound quality is more of an issue with the 1953 performance of the Tchaikovsky Concerto from the Hollywood Bowl. As a performance, I found it the least successful of the three ‘big’ concertos. I find Steinberg’s conducting here rather pedestrian, which doesn’t inspire the violinist to give of her best. The more lyrical sections lack poetry. The fiendishly tricky double-stop passage in the development section of the first movement sounds rushed, though the cadenza which follows is technically secure. She does, however, capture the Russian melancholy of the slow movement. It’s obvious at the end that the audience don’t share my misgivings. As an encore she plays Bjarne Brustad’s “Trollkvenna” (“The Troll’s Windmill”) - fourth movement from Eventyr (Fairytale) Suite for solo violin, a sort of chromatic roulade with pizzicato thrown in for good measure. In the Barber Concerto, Wicks’ warm, heartfelt approach to the composer’s early lyrical style is fitting, whilst the finale is dashed off with panache and élan. There’s no doubt, listening to the evidence, that Wicks had a stunning technique and gives impressive accounts of the nineteenth century virtuoso violin concertos and showpieces, of which there are many fine examples here. Both Wieniawski Concertos are included. No. 2, from the Hollywood Bowl with Leopold Stokowski dates from 1948. The Romance is fervent, and the third movement has a quicksilver audacity and sparkle, certainly giving Heifetz a run for his money. The First Concerto has always been my favourite of the two, though it is less frequently performed and recorded. Michael Rabin made a magnificent recording of it. Wicks is accompanied on the piano by Horace Martinez, and the concerto is a splendid vehicle for showcasing her phenomenal violinistic arsenal. Equally dazzling is Sarasate’s Introduction and Tarantelle, with orchestra, where there’s some crisply articulated spiccato passages. There are glittering accounts of Sarasate’s Zapateado, Malagueña and Wieniawski’s Scherzo-Tarantelle. Joachim’s arrangement of Brahms Hungarian Dance No. 7 has swagger and tastefully applied rubato. The only disappointment is Kreisler’s Tambourin Chinois which sounds too frenetic. The Schubert Ave Maria, in the arrangement by August Wilhelmj, is heard in a recording dating from 1960, and the presence of an audience is confirmed by the odd bronchial contribution. Wicks draws a rich full-bodied sound from the opening melody on the G string. The treacherous fingered octaves are delivered with immaculate intonation, and the double-stops are vibrant. This captivating reading stands comparison in every way to Heifetz’s three commercial recordings. Ysaÿe’s Third Solo Sonata and the Ravel Tzigane receive technically stunning readings. Lyricism is the underlying element in the Beethoven Sonata No. 10 in G Major, Op. 96, and Wicks conveys the spirit of the work with freshness, spontaneity, affability and passionate intensity. The Richard Strauss Sonata from the same 1986 recital is a spacious reading of intense drama and lush romantic gestures. An alternative performance of the slow movement from 1973 is a bonus. The Debussy Sonata is idiomatic and invested with a wealth of tonal shadings. Ravel’s Sonata Op. posth. from the same 1991 Houston recital is a pleasing addition — it’s a work I’ve never heard before. A beautifully managed performance of Fauré’s Violin Sonata No. 1 in A major, Op.13 from 1985 has some sparkling spiccato bowing in the third movement. Germaine Tailleferre’s Sonata No. 1, another work new to me, is a luminous account and a pleasurable listen. Audio restoration, editing and mastering has been carried out by Ward Marston, to the usual high standard of Music and Arts. The producer Nathaniel Vallois, who is Senior Violin Teacher at the Birmingham Conservatoire and also teaches at the Purcell School of Music, UK, has an interest in historical artists, and counts Wicks as his mentor. He has provided an excellent nine page comprehensive, detailed biography, plus a substantial essay on the relationship between the violinist and the composer Ernest Bloch. An engaging performance of the composer’s Sonata No. 1 from 1980 is included. This rewarding release will be welcomed by violin aficionados as providing a valuable addition to this distinguished artist’s slender discography.